Merry Christmas.... and stuff. :) - Memorize Your Lines and Try Not To Bump Into the Furniture. 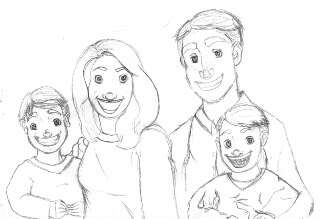 Since none of our pictures came out this year, I present to you a cartoon of my family, drawn by alittleredhood. And I'll get those Christmas cards out this week. They say "Happy Holidays." It doesn't say WHAT holday. I figure President's Day sounds about right. I hear:: Nolan Snoring. LOUDLY. *giggles* You guys are cute no matter what! Merry Christmas!! Yay for ambiguous holiday cards! Merry Christmas! That is so cute! My sister makes her own cards each year with photos...wait until I tell her about yours. Very creative!! Merry Christmas as well..and about that snoring...I can hear Kyle right now snoring as I sit in another room and type this...if there was a talent competition somewhere for snoring, my husband would be a contender.